(Newser) – Construction workers fixing up a German castle may have stumbled across the remains of a Swedish count murdered more than 322 years ago for romancing the wife of the man who would become King George I of Britain, Motherboard reports. 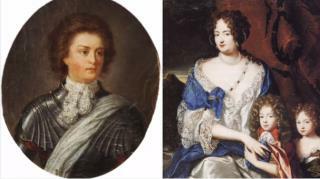 According to Smithsonian Magazine, German prince Georg Ludwig married his first cousin, princess Sophia Dorothea, for political reasons. By all accounts, Georg was a massive jerk, openly sleeping with other women and rubbing his favorite mistress in Sophia's face. Enter Philip Christoph Königsmarck. Philip and Sophia would exchange 300 love letters over the course of their two-year illicit love affair. Until, it is suspected, a friend of theirs ratted them out to Georg, according to a press release. If it turns out to actually be PCK, I guess one could say that that was screwing he got for the screwing he did! This could be a start of a historical romance novel. Oh, my! That pair of paintings! I mean, he is just sooooo purty and sensitive! And she is quite handsome and studly! A match made in whatever passed for Tiffany's in the day?